Danielle Holm – Running From the Truth! THE CHALLENGE! – Kent Hovind v. Robert Baty – The Great Debates! Home→Danielle Holm – Running From the Truth! THE CHALLENGE! When I first heard of the Baby Holm case back in December of 2016, and of how Brady Byrum was secretly assisting them in an effort to promote sovcit theology and guarantee that the baby would not be returning to the parents any time soon, I tried to get them to talk to me and they refused to do so. 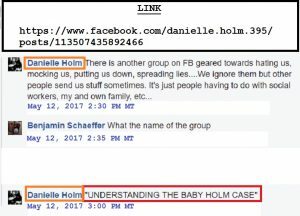 I ultimately set up the “Understanding The Baby Holm Case” to report on the story and provide a venue for others to discuss the truth about what was going on with it. The Baby Holm parents have continued to refuse to face me and discuss the merits of their case. 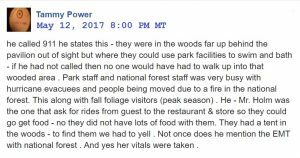 Today, Danielle Holm, the mother, has posted an attack on my group and what we do there. Therefore, I thought I would document that and respond to just a little of what she had to say. Apparently we are being stalked, mocked, hated on. People calling us ugly, dirty…because they are having a hard time finding anything else. I’m being attacked for wanting to attempt natural childbirth. Here is my answer: How does anyone know how we dress and live? We are clean. We shower daily. I wear dresses and today wearing leggings and a tanktop and tennis shoes. Christian wears shorts and t-shirts. Is it because I have found love within and have taken off the caked off makeup and have found beauty within? I mean, I’m not getting it. So, when I was more vain, less humble and not aware of myself and was insecure, and competing in the gym daily with a six pack of abs and on stage earning trophies..would I be considered worthy to be a mother then? Do I need beauty trophys in order to be a loving mother? Do I need to spend all my money on fashion and jewelery and makeup in order to be worthy? Beauty is within. I used to have about 20,000 dollars worth of jewelry, was I more worthy then, now that I don’t believe in adorning myself falsely with jewels? If they you want to judge us for dressing in clean clothes, and clean shoes and showering, and brushing our teeth every morning and every night and wiping our butts, then let them. Everyone, open your eyes. Look at our pictures. Do we really dress any differently than anyone else in Alabama? They have nothing else to take us down with, so they act like adolescents and call us ugly and dirty. As far as birthing… What is wrong with natural, God given birthing? Do people not experience natural home births in birthing centers, their homes, hotels, etc…? Did you know midwifery is not allowed in Alabama, but unassisted birthing is? This is not a new concept. In fact, hospital birthing IS. Are our bodies as women designed to give birth? Why do we fear God’s design so much? Our spiritual beliefs absolutely include natural.God’s law, God’s design. It’s not either/ or. It’s all the same to us. We should trust in God with all our hearts and stop blaming God for bad things that happen. All who judge are not aware of themselves and are in fear of God’s laws because they do not trust God, do not love God and do not know themselves. We will just stand strong and closer to God through the mockery and hate and we will continue to love. Following is a screen shot of just part of the discussion which followed the above post. Danielle does not provide any specific details as to what she is talking about, and so a specific response to what she claims about my group is premature, except maybe to deny her characterizations. The Baby Holm problem never was about “natural childbirth”. However, the fact that two transients without readily available transportation or other “means” chose an out of the way spot in a state park to have an unassisted birth, which effort failed, is an important factor to be considered in evaluating whether or not the parents should be trusted to disappear with an unidentifiable newborn child. C. Clarke Holm, Danielle Holm, come out and face me, or send me your champion. We have a lot to talk about and it’s time to get started with the negotiations.